Nowadays dogs became the members of our families. We love dogs and take care of them as well as of everyone in our inner circle. Your Staffy, Pitbull, Amstaff or Bull Terrier is your faithful friend and defender, he will lay down his life for yours without a moment's hesitation. And such an infinite devotion of your Staffy should be justly rewarded by your caress, kindness, heart and the beat of care. 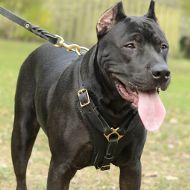 And of course, it's impossible to grow up your Staffy or Pitbull without special dog equipment and dog accessories. Why does your dog need them? The dog products make your dog's and your daily life easier, the dog training becomes much more successful and the dog control is getting simpler. 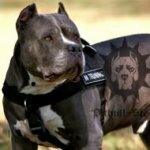 Our Pitbull Store offers a great variety of premium quality dog products for Staffy walking, training, sports and grooming. And some of them became real best sellers for many years of our work. 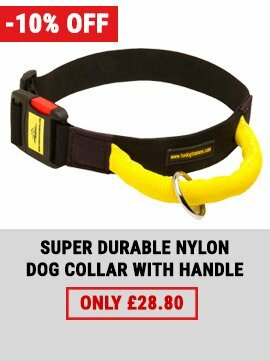 Now we have the range of the most popular dog supplies, which were approved by our standing customers and professional dog trainers and have a lot of positive feedbacks from around the world. We hope that our clients-based list of top ten dog products will help you to choose the most suitable items for your beloved dog. 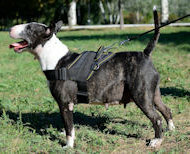 This agitation dog harness is accepted by experienced dog trainers as a strong and reliable security harness for attack and protection work. 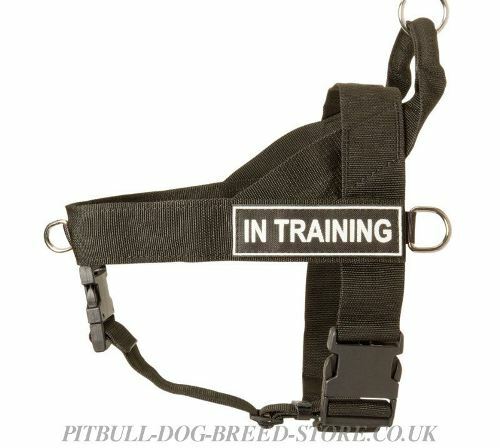 The harness has wide felt-lined breast plate, neck straps and back part, which prodive supreme comfort and safety for your Staffy during intensive training. 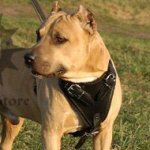 Try this strong leather dog harness for a variety of Staffy workouts or just for Staffy walking and you'll fully realize the functionality of the harness. This is an excellent example of luxury design and multi-functionality. 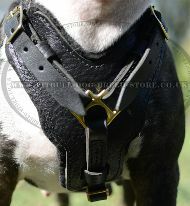 You can use our large dog harness for Staffy training, working, heavy loads as well as for walks in style. 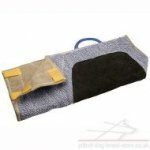 Felt padded breast plate will protect your active Staffy from skin rubbing and discomfort. 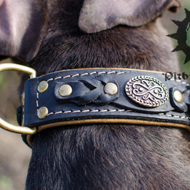 Gold-shining brass details will make the dog look stunning. 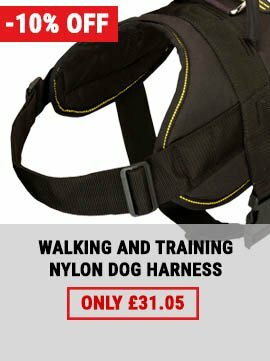 This nylon dog harness is one of the most popular dog products among our clients for its usability, convenience and multi-tasking usage. 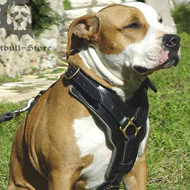 Lightweight, durability, comfort and reliability are combined in one nylon harness. 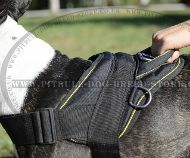 Moreover, the harness gives you maximum control under your strong Staffy due to solid nylon handle. 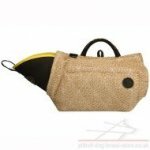 And water-resistant nylon allows you to walk and train the dog whatever the weather! 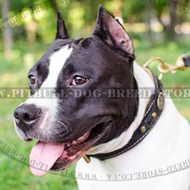 Is your Staffy trained for police, K9 or service work? 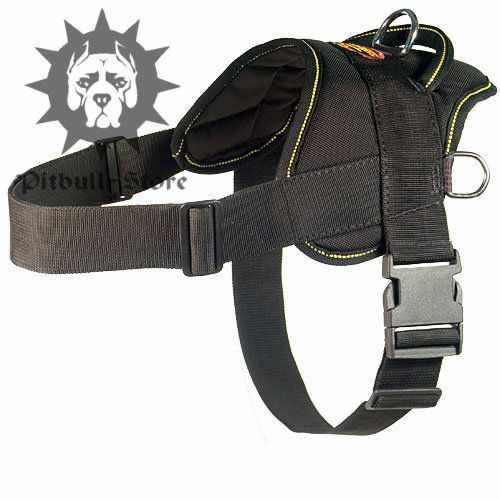 Here is the most suitable nylon dog harness for working dogs. We created this harness with the guidance of the best cynologists to make it functionally excellent for working and training. 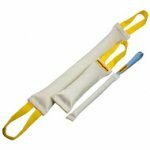 It's also the best dog harness to stop pulling. 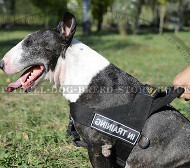 Removable ID patches will help you to show the kind of your Staffy's activity. 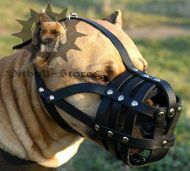 You know, that it's not easy to find the ideal dog muzzle for your Staffy. 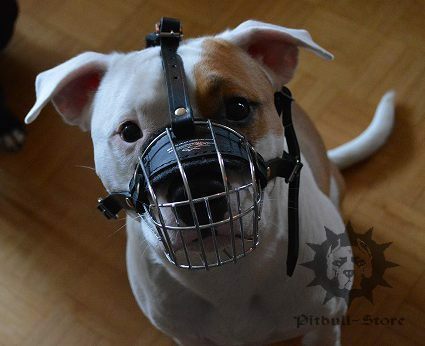 But you won't go for a walk, in public places or to training lessons if your Staffy isn't muzzled. 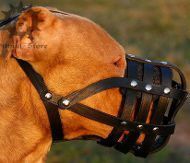 Our experts solved the problem of uncomfortable, insecure and heavy dog muzzles creating this light-weighted, super convenient and reliable dog muzzle of wire with perfect airflow. 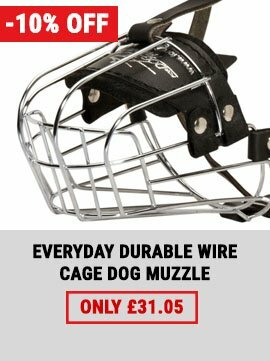 Now you can put the muzzle on your Staffy without having a fear that the dog will bite somebody or eat from the ground, or take it off with its paws, or have any discomfort wearing this wire dog muzzle. 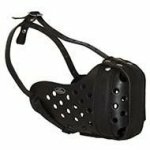 This leather dog muzzle is designed in the same manner as our previous muzzle model, it differs only with the material - it's premium quality real leather. 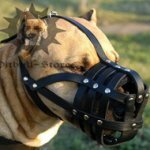 Which one dog muzzle is better for your Staffy? They are both great! 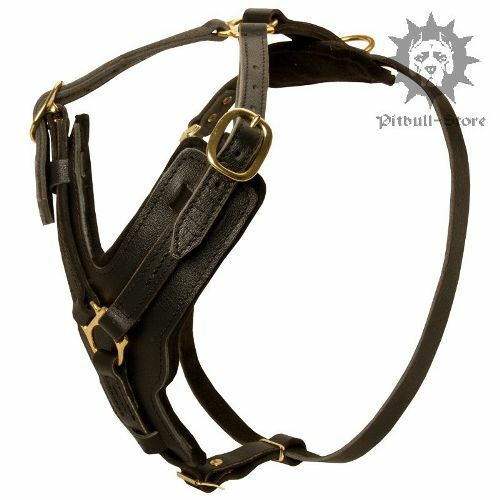 It depends on your taste and attitude to the muzzles' constructions. 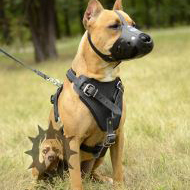 Our clients consider both muzzles perfect for their dogs. 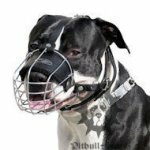 By the way, the dog muzzle is an individual accessory, so we designed the dog muzzles according to Staffy, Pitbull and Bull Terrier facial structure. 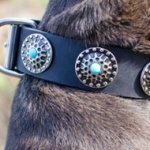 Our craftsmen proved that it's possible to combine royal design together with durability in one dog collar! 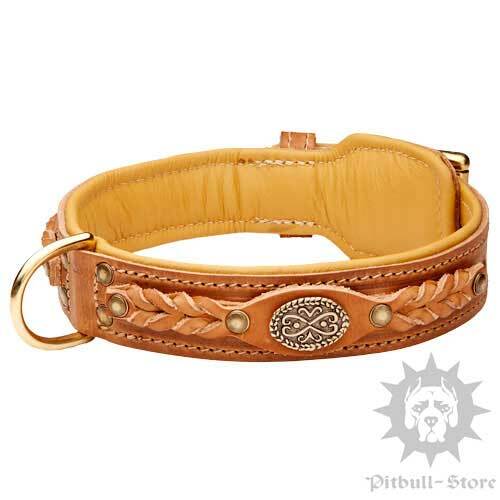 And this royal leather dog collar is an elegant demonstration of their work. 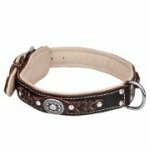 Choosing this handmade leather dog collar you give your Staffy gorgeous look owing to luxury decoration, wearing comfort due to soft Nappa padding inside and you get a reliable dog control item by means of thick leather and extra firm fittings. 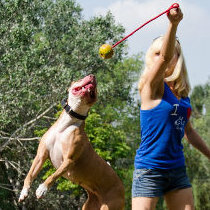 Dog leash is a must-have accessory for almost any activities of your Staffy. Looking for the best one? 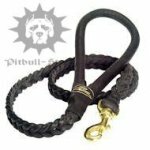 Here is an extra durable leather dog leash with convenient handle and braided elements that will resist even the hardest loads and won't break! 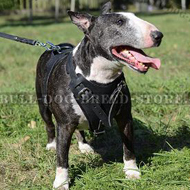 Perfect variant for strong and active dogs like Staffy, Pitbull or Bull Terrier! 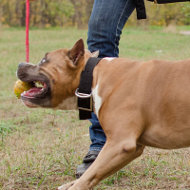 Be sure, your Staffy will be excited of this dog ball on string, because it can bite, chew and play with the ball and have a lot of fun. 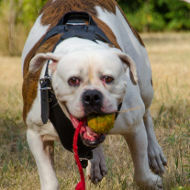 The dog ball is made of non-toxic solid rubber. Besides, it resisted strong teeth of four-legged "chewers". 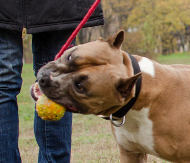 Use the dog ball for Staffy training and joyful games. 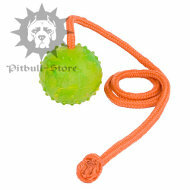 Make your Staffy's life full of fun and happiness even during training with this rubber dog ball. 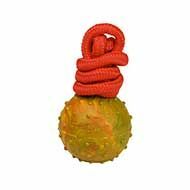 Mix-up dog exercises and make them interesting using this safe and solid rubber dog ball on rope. 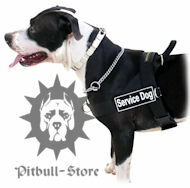 You can find all these dog supplies in our Pitbull Store. 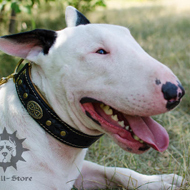 If you have some questions about our dog products, please, contact us by our e-mail: info@pitbull-dog-breed-store.co.uk or find us on Facebook. 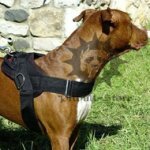 We will help you to choose the best equipment for your beloved dog and reply to all your questions with a great pleasure.